A long time user of this ap. I find the guided meditation very helpful in keeping my focus. When I used it consistently I find that I have no need of the guided meditation and I can just meditation in silence. So far I have not been disappointed in any way with this app. It’s easy to use, effective in its goal to teach and guide one in the art of mindfulness meditation. It’s extremely easy to incorporate into my day no matter what time of day you have available. I highly recommend this app! My classes love ending a hard fitness session with 5-10 minutes of mindfulness! Thanks! Great guided tutorial! Excellent for beginners. You can pick how much time you want to allot to meditation. 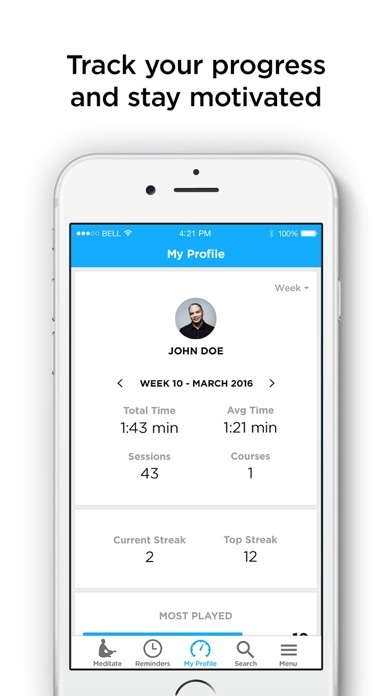 The app eases you in an doesn’t make you commit to long periods of time. It helped with depression and anxiety! It really helps me stay consistent with my meditation practice. Catherine’s voice is very soothing and keeps you focused. I use the premium content and my practice has gotten so much more focused and intentional. The wide variety of contributors and topics is amazing! Some of the best practitioners today have lent their voices and wisdom. I love this app!! Helps me to focus on my breathing. I am very much enjoying this app. This app is so awesome!! I especially love the timed guided meditations. You can choose from rain, stream, beach, waves, just to name a few and the sounds are exactly what you would find if you were really there experiencing it. I highly recommend this app! 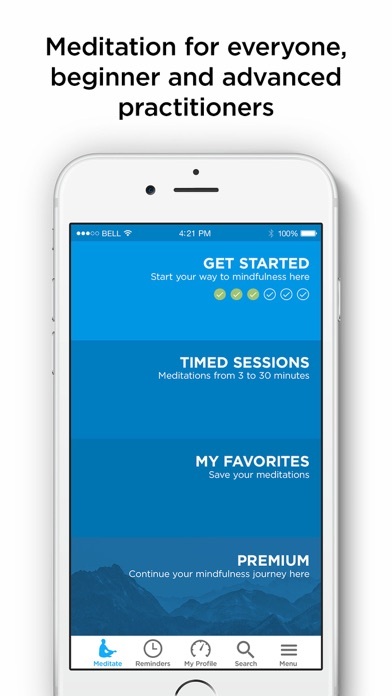 Love the app, I feel like the guided mediation has become a familiar friend! I'm so happy I got this app. It helps me relax and relieve stress. I teach at a school where Mindfulness is used by the ENTIRE school. It's THAT beneficial! This app helped me to get my life back! Much gratitude for this app. No people of color in your group...it’s very important to me to see a diverse group of people for me to learn from. I will be to stressed to meditate from your app. It’s a nice app to get you relaxed focused and mindful. I didn’t even know they made apps like this. My counselor told me I should download this app to work on my breathing skills and grounding for when I have an anxiety attack. This is app is calming and relaxing, sometimes so much so that I could take a nap afterwards. Being mindful and meditating is new for me. So far I have found it interesting and it gives me a lot to think about. Awesome App...was definitely what I was looking/aiming for! The mindfulness all is a great tool for at home or on the go to practice mindfulness and Meditation. It’s easy, and versatile. I highly recommend it! Love this app. The guided meditations helped me relax and focus. 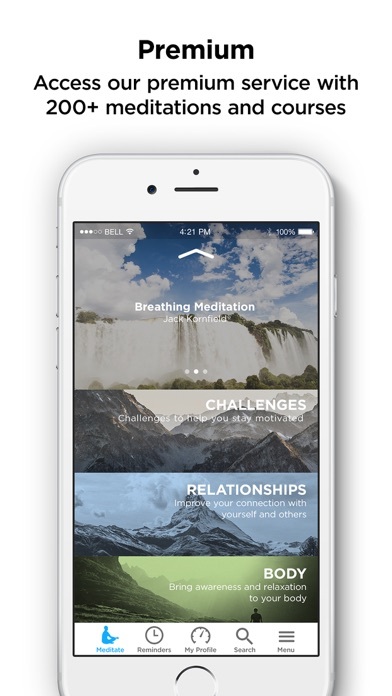 The in-app guided meditation is great, and I love that I can set my own custom mediation. 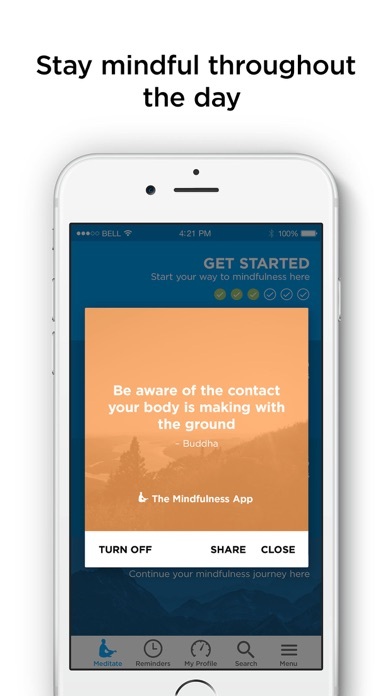 The meditations you can purchase through the app are from amazing professionals—I go back to these again and again. This app has helped me so much. Great for a beginner or an experienced meditator. Great app! So helpful and calming. Great for beginners. I only wish there was more variety for the timed guided meditation sessions. I’m a beginner at meditation. For years, I’ve wanted to practice, but never really found the discipline. I highly recommend the three-minute guided meditations to anyone else who may be wondering where to start with their new practice. These are meditations from great teachers, and I find what I need in my darkest moments. The breadth and choice is wonderfully presented so that is manageable. I use it personally and for our Mindfulness Cancer Recovery Group. I truly enjoy this app! The sounds are beautiful and pleasing. I have been using the app for several years. I find the choice of instructors and the various lengths of the meditations very helpful. The teachers are top notch. Thank you for such a great resource! First of all, I must admit that I find the idea of using an app to meditate is a bit silly, other than a timer with a bell, as people have been meditating without apps for millennia. Nevertheless, I’m now using other apps that connect to the new Apple health, so I thought why not use an app that feeds into it. Aside from several apps that are ridiculous in complexity and price, this one looks a bit more reasonable and usable long term. The first few uses were good, except it added a new dimension to meditating: constant eye-rolling at some of the cheesy phrases: “find a position with dignity”, “offer your breath back to the space”...etc. “Congratulate yourself”...Congratulate yourself after a retreat - not 5 minutes of meditation! I realize that any meditation app will be made by new agers, but I find it distracting from the task at hand. I recommended that the narratives be tested by people who like to meditate with a minimum of woo. I will persist in using this when I am not using the simpler “mindfulness bell”. I have only been using this app for a few days and I already fill a difference. Breathe and be in the moment. I had never tried meditation before getting this app. So far so good. It definitely takes practise, and the app is working well for me.